March 23, 2017 (LiveActionNews) — In a village in the Philippines in 2014, a little girl was born without limbs. At six months old she was placed in an orphanage for children with special needs, where she waited for a family to adopt her. In October of 2014, when she was nine months old, the Stewart family saw a picture of the little girl and decided to adopt her. 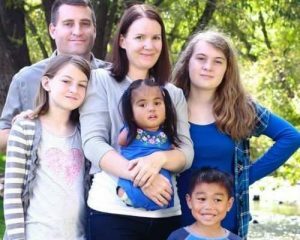 It would take months of paperwork and a trip to the Philippines, but a year later, Adrianne and Jason Stewart were bringing little Maria home to join their family of five, including two biological daughters and an adopted son. “When we found our daughter we did not think we were qualified or prepared enough to parent a child like her, a child born without arms and legs, but we knew that we could love her and that loving her was what mattered most,” Adrianne Stewart wrote in a post for Love What Matters. At about two years old at the time of her adoption, CNN reports Maria was unable to hold up her head and her parents knew they had a lot of work ahead of them. She now receives speech and occupational therapy and attends preschool in an inclusive classroom. Since sharing their story in hopes of inspiring other families to adopt, the Stewarts have received a lot of positive notes. However, they have also heard from mothers who have chosen abortion when their preborn children were diagnosed with conditions similar to Maria’s. These women express to the Stewarts their abortion regret. Adrianne Stewart hopes that Maria will help other expectant mothers choose life when faced with similar prenatal diagnoses. This entry was posted on Monday, March 27th, 2017 at 2:28 pm	and is filed under News & Commentary. You can follow any responses to this entry through the RSS 2.0 feed. You can skip to the end and leave a response. Pinging is currently not allowed.